This is what all people tend to see. No one makes that extra effort anymore, no one cares actually, to know what’s beneath the surface. I was thinking today that when we were young, we used to “know” people who are smiling are happy. Now, I’m almost certain people smile to keep from crying! It’s not a big deal to be unhappy- usually we have to be that to become really happy. What’s truly a problem for me is choosing the correct way to speak and the right thing to do in front of people because I can’t guess if the face they’re wearing is their own or a mask they built especially for the occasion- I only know what mine hides. There’s a few people left who, as Meg Ryan puts it in the movie “French Kiss”, put the corresponding face to the corresponding feeling. I discovered I’m losing that luxury as well! The last thing you need when you’re overwhelmed with emotions, of sadness, depression or hot raging anger, is someone patronizing or pitying you. The thing is you’ll find people eager to “listen” to your “sad” story not to comfort you, but to feel better about their own! It’s as if your own misery can add to their happiness! Yes, people are cruel this way. As time passes, we turn into actors mimicking a life we want people to think we actually have! We laugh when our hearts are weeping, fain Content when disappointment is taking over our souls. We do it because we’d rather have an imaginary happy life instead of a miserable real one. 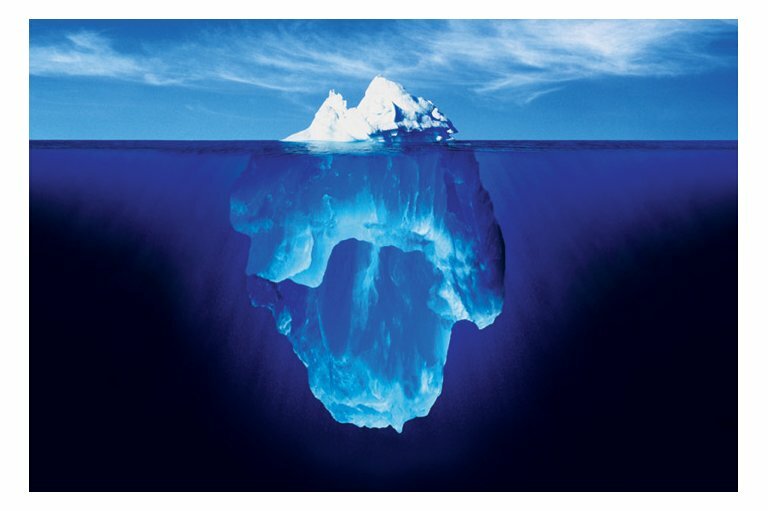 All we want others to see is that tip of the iceberg, lovely and seemingly peaceful when in reality what we hide is far greater than what we show. We hide them since they are not so perfect, they harm the “image” we have drawn ourselves in the minds of people. As true as all of that can be, just like anything in life there are exceptions. Some people are not fooled by the lovely tip of the iceberg. They dig in deeper and we let them in because they actually cared enough to make the effort. The rules change at that moment and we become free to be ourselves and even though it happens only for a few moments every once in a while, it’s a relief. I’m grateful to have such moments and I know I’m lucky. I wish it can be the same for all of you readers. This is my message, a humble but honest prayer that everyone on this planet gets to share the rest of their “iceberg” with someone worthy of that challenge.